Spread throughout much of the central plains of southern Africa, the Springbok (Antidorcus marsupialis) roams the open grassland. Able to jump over 3 meters high and run at speeds up to 62mph, surely one of the more agile creatures on this earth. The name “springbok comes from the Afrikaans words spring, which means to jump, and bok, which refers to a male antelope or goat. The scientific species name “marsupialis” comes from the Latin word “marsupium” meaning “purse” (5), referring to the springboks folds of skin that reveal the long white crest of hair. Being one of the most adapted antelope on the dry savannas of southern Africa, the springbok can occupy almost all of Africa’s harshest environments. It is also an iconic animal for many southern African peoples and are most remembered for their unique jumping behavior. An iconic and unique mammal to the continent of Africa, the springbok begs for an interest from all types of people. 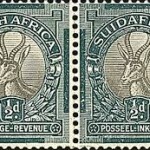 Similar in physical appearance and size to Thompson’s, Dorcas and Grant`s gazelle, only differing in size by a few inches, it is the Springboks unique stethoscope-shaped horn structure that sets it apart with no doubt. Standing 28-34” tall and 3’2”-4’6” long with a weight that can vary 58-106 lbs (1), depending on season and quality of grasslands. Tan-brown to cinnamon body with the underbelly and neck having areas of white. A reddish-brown side stripe runs hind limb to forelimb. The springbok also conceals a crest of white hair on its lower back that is usually kept in a fold of skin, only to exposed when startled or in alarm. The head is mostly white, while a dark brown, almost black stripe runs down from the eyes to the mouth. The eyes are long and slender, perked straight up when the animal is alerted to a noise. Both female and male display the curved, ridged horns, with the females being much narrower (2). The Angola and Namibian sub-species are considerably larger and with better developed horns than the South African species (1). With a range extending through southwestern Angola, Namibia, Botswana and South Africa (4), the springbok has developed many unique adaptations that help the animal lead a successful life in Southern Africa’s most hostile and arid lands. The adaptations come into pay in many parts and stages of the springbok’s life. The development of opportunistic feeding helps the springbok be able to eat year around without having to have a vast migration like wildebeest or zebra to find more fertile lands. During the wet season (summer) the herds graze on growing grass and herbs but in the dry season (winter) they simply switch their feeding habits to browsing on shrubs, which still grow through the drier, colder winter (2). This ability to switch feeding habits allows the springbok to occupy harsher mountain highlands than most other savanna grazing antelope. The springbok can also go without drinking as long as its food source contains more than 10 percent water (1). To maintain this, springbok with feed at night when the humidity is higher and the vegetation contains more moisture, although they will drink whenever water is available. Mating also reflects this amazing adaptability. By doing away with breeding seasons, the springbok can breed year-round, usually births peak around the rainy season, the mothers timing their births with the growth of new grasses and shoots. Gestation usually lasts 6 to 7 months usually resulting with the birth of a single lamb. The new lamb is left hiding in a nearby area of dense foliage, while the mother grazes close by. The mother returns to nurse the baby, since the springbok is a mammal, the baby relies on its mother to feed on her milk (which is full of fat and nutrients) and to protect it until it is ready to graze on its own and join the herd. Around 3 to 4 weeks of age the baby springbok is now strong enough to join its mother in the herd, but is still dependent on mother’s milk. It is only at 5- 6 months that the lamb is weaned off the mother and grazes as a member of its herd (2). Females may stay with the herd for the rest of their lives while males usually leave between 6 to 12 months to join a roaming bachelor herd, thus splitting up the local DNA, allowing the diversification of the springbok gene pool as a whole. The springbok comes into sexual maturity at around 2 years of age, however the males must show their worth in order to mate (2). To be able to have the opportunity to breed with a female, a male must be able to defend a territory with resources that are attractive to a female. To prove their worth males will fight each other, defending the most attractive territories, in the end, the one with the best territory breeds with the most females. Taking place usually before a peak in births, this fighting among males is known as the rut or rutting periods. Using their curved horns as weapons in these fights, some horns may lock together causing one or both participants to die (2). The springbok gets its common name from its iconic “pronking” behavior. 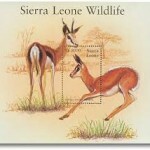 This display is a type of stotting, or high bounding (1), whereas no other antelope can compare. This behavior is made up of many, stiff-legged jumps, up to 3 meters high, with their heads down, back arched and its white crest fully erect and exposed (1). 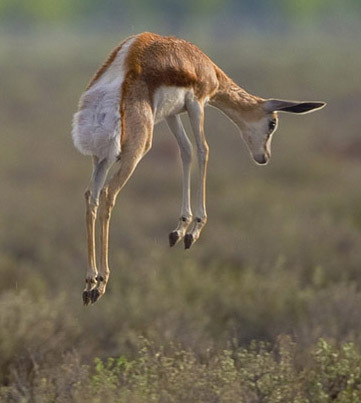 This “pronking” is a result of many things in the springbok’s life but is usually related to some sort of excitement. They also use it as a sort of orientation, to get a better look at their surrounding and to locate predators or other springboks. It is also a response when predators make themselves known, the springbok that can jump the highest, are the most fast and fit of a group. The predators usually take advantage of this clear highlighting of the weaker animals and attack the ones with smaller, slower jumps. The most interesting form of this behavior is a social form. When the springbok are in this “pronking” position and the folds of skin are pulled back revealing the white crest, the folds are secreting a strong, sweet odor that sends out a visual message, from the actual display, and a scent message to the springboks in the area of some sort of excitement. 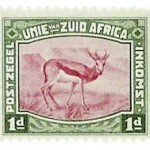 The springbok is also very common in the culture and people in South Africa. 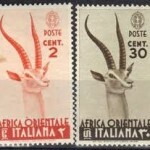 South Africa has adopted the springbok as an symbol or emblem well before the institution of apartheid was in place. 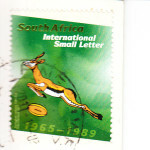 From the Coat of arms to the South African National Rugby team, the springbok symbolizes speed, agility and gracefulness. After the defeat of apartheid, the ANC decreed that all national sports teams to be known as Proteas, yet the national rugby team holds true to their original name, The Sprinkboks, thanks to Nelson Mandela, in good favor for the white population as he was newly president at the time. Springbok also appears regularly in the markets as biltung, dried game meat similar to jerky, along side buffalo, wildebeest and other wild animals. The springbok is also present on the symbol for South African airways and even was featured as the symbol for the car the “ranger” a South African made car. biltong recipe, youtube video. images needed here.